I know when I ask for suggestions or opinions here I am opening myself up for many diverse options to choose from. When I say many I mean five or so. But still, for a girl like me five is a lot to consider. When I asked for help in regards to shopping organically I got many really wonderful suggestions. I thank you for that. The stand out suggestion was given by my good friend Josie. It was then reiterated via Facebook chat by another friend named Laura. What was the suggestion? Nature's Garden Delivered. What sold me? DELIVERED. No really. I'm so serious. That, and it's all organic. But really, if you tell me you walk and talk like a CSA yet you walk yourself to my door we are an instant match made in heaven. Beyond the delivery selling point you may be wondering what else makes it so fantastic. I will tell you. 1) Your typical CSA provides you with a big old box of locally grown goodness. The downfall is that you get what you get (and you have to go get it!). So, if you don't particularly like eggplant and you get two of them what on Earth do you do with it? With NGD you set your preferences. If you don't eat eggplant you tell them you never want it. Done and done. Plus, if you got too many apples and didn't finish them last week you can exchange this week's apples for something else. You get three exchanges per week. 2) There is no major commitment. You sign up for weekly or every other week and then cancel if you don't like it. If you pick the large box and realize your eyes were bigger than your belly you can pick the small one next time. Flexibility is key. 3) Add ons. NGD offers a range of items in addition to the fruits and veggies boxes. They have eggs, milk (not fully pasteurized), bread, some meats, spices, etc. I have gotten random meats, eggs, bread, and milk. All of it has been fantastic. I will not reorder the milk simply because it's not fully pasteurized. But, the bread is so yummy. The eggs are better than any organic store bought I have had. The meat has been amazing too, but is very expensive. 4) Recipe education. I know that I love bok choy, but I don't buy it too often and have little knowledge of how to cook with it. While at the beach for my friend Kim's wedding I had to approve my box on my phone. If I'm being honest, I had relaxed nicely with a few beverages and maybe wasn't totally paying attention. We ended up with two gigantic things of bok choy and 8 onions. 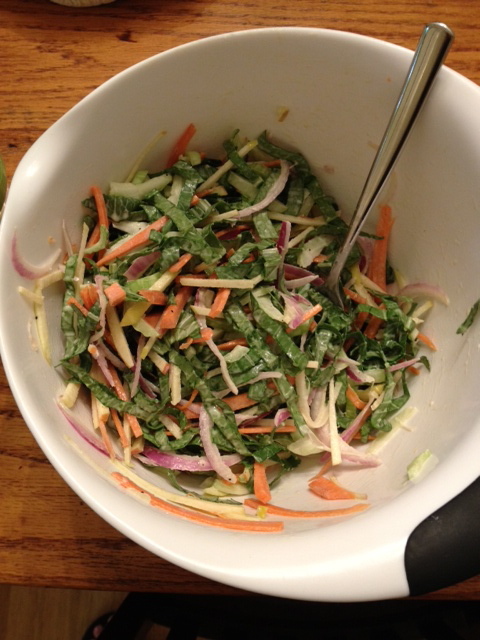 I quickly checked Pinterest and made this salad out of the bok choy, apples, and carrots that all came in our box. AMAZING. So now I try to be open to things and try new recipes. In fact, in an effort not to waste anything from the box I buy less from the store. I was already shopping on the "outside" aisles of the grocery store and not buying anything from a box (except cereal). But now I strictly buy things like milk, yogurt, meat, cereal, and Lila specific foods at the store. This literally takes me all of ten minutes. BRILLIANT! Since this first box, getting our box on Tuesdays has become a bit of a ritual for us. Lila gets so excited to open the box and take out all of the items. I do eggs, bread, and granola every other week. I have bought grass fed ground beef multiple times now, but the other meats are just too expensive. They don't do chicken yet so I'm anxiously awaiting that. They recently started Almond butter which we will get once our peanut butter runs out. Here's what you are thinking. Jana is going to be so skinny and so healthy within minutes because all she eats are fruits and vegetables. I wish that were true for me and for the rest of our family. Lila is the pickiest eater. She eats a lot of the fruit but she has a short list of other foods she will eat. I try not to make a big deal out of it. I figure we can cater to that within reason while offering her the good stuff. I'm hoping the box opening ritual helps too. I also feel like if she lives off of fruit, milk, yogurt, sweet potatoes, carrots, bread/granola, and salami (random I know) then she's doing ok. The problem comes when we leave the house. I eat on the go a lot due to my super glamorous second job. We eat out a lot socially on the weekends. When we eat out we do not try to eat well at all. Now that I feel like what's in my house is under control my next goal is to make the eating out fit this mold as well. We shall see. There you have my full review of NGD. LOVE IT. Big ups to Josie. Now if I can just figure out how to get all non-food items from Amazon at the best possible price I will be one happy camper. While it may seem that I am incredibly lazy in my quest for all things delivered, I feel I should stand up for myself. I am a SAHM. If I'm going to cart my little chickies somewhere I would just rather it be the playground over the grocery store. Evie is at the "I hate all things that buckle me in" stage. While little embarrasses me these days, the horror movie scream just flat out gives me a headache. Why not choose the best of both worlds and have organic, amazing food brought to my door? Who am I kidding? I wish everything delivered. I actually wish a stylist would show up at my house once a month with racks of clothing in my size and taste and then just make me look good. Is this what happens for rich people? Call it lazy. I call it making the most of my time. Thanks for the shout out! And it is not laziness at all. Going to the grocery store has always been one of my least favorite chores. But now that I am a working mom, it is the last place I want to spend time. Another plus of NGD is that you know that your family is getting a variety of produce, and therefore different nutrients, because it is easy to get stuck in a rut or shy away from the more expensive items...the set price is also nice :) And I agree that the bread is delicious. All things considered, the price is kind of unbeatable too. And I get as much on Amazon as possible, too. So if you are lazy, so am I. But I think that buying things tax free, with free shipping (it was totally worth it for me to sign up for Prime), and with the best possible ability to comparison shop is smart, not lazy. Plus you eliminate costs for gas, wear and tear, time, and stress (yes, I often convert my time and stress into dollars when making decisions). So I'm totally thinking of doing the NGD thing! What size box do you end up using?